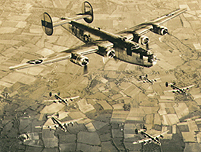 B-24 crew with the 446th Bomb Group, 706th Bomb Squadron stationed in Bungay, England. His "tour" of 31 combat missions only lasted a little over two months. 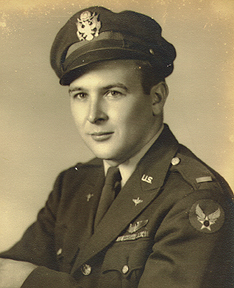 His first combat mission was on June 6, 1944 (D-Day). The last mission for my father and most of his crew was on August 15, 1944. After my father died in 1988, I set out to track down and contact as many of his crewmates as possible. After four years of "off and on" searching I had accounted for the whole 10-man crew. Now and then I meet with the survivors at reunions. More often I call them on the phone to pry out more stories of the missions they shared with my dad. Long ago these men were my dad's closest friends, now they have become "mine." Luckily, my dad was a "pack rat"...he kept everything from his service days. I had my father's uniforms, wings, medals, patches, maps, photos, journal, and much more. It made for a good collection. But here the story gets even better. My father's crewmates have very generously passed much of their remaining World War 2 items on to me. Now I have a great collection! It has to be a rare occurance to have so much stuff from one crew surviving in one collection. The centerpiece being three leather A-2 jackets, each complete with patches, "nose art," and "bombs." These wonderful items belonged to the co-pilot (my dad), the navigator, and the tail gunner. To view some of this grouping and to read more about my father's 8th Air Force experience, select "Next page" below. To read his daily journal entries, select "Journal" below. (Left) My dad's pilot's wings. (Right) Gunner's wings. All that the ball turret gunner still had of his WW2 "stuff." They are pinned to the letter he sent presenting them to me. Some of the 446th in the air.